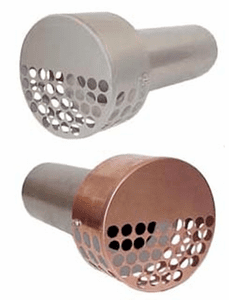 Our Stainless Steel Dry Vents are far superior to plastic dryer vents. Removable vent cover for easy cleaning. Animial proof mesh prevents critters from nesting. Fits standard 4" diameter dryer vent. Larger custom sizes are also available. Homes today are built tighter and more energy efficient. Tight homes can cause cause drafting problems. When a chimney can't draw fresh air from the home, smoking problems can occur. Our fresh air kits can help solve that problem. Installs through an outside wall to let fresh air in where your heat appliance is located. Works by taking advantage of the negative air pressure of tight homes.